Warehouses: 16,000 casks on Islay (Port Ellen, Lagavulin and Caol Ila), dunnage. Majority of the casks are stored on the mainland. 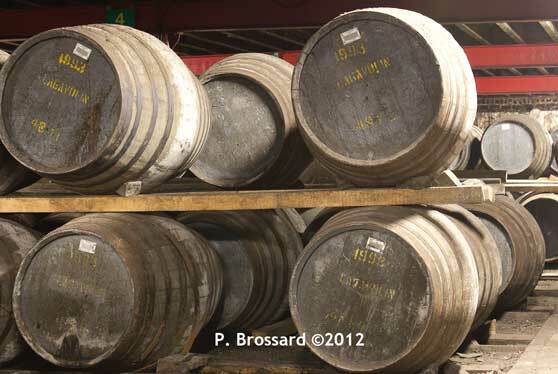 Casks used for maturation: 3rd fill bourbon (99.5%) and sherry casks (0.5%). Contribute(d) to the following blends: White Horse, Logan. Since 2002, a 12 year old version Lagavulin is bottled at cask strength as part of Diageo's Annual (special) Release. 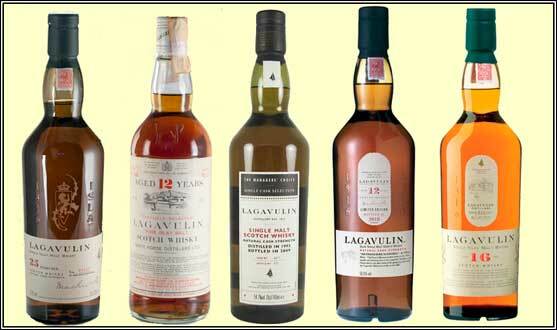 As part of the Annual Releases, a 21, 25 and 30 YO have been released, as well as a 1993 Lagavulin Manager's choice. Some single casks have been bottled for the Feis Ile, as well as one bottling for sale exclusively at the distillery. Several of the official Lagavulin: The 25 YO, the first (?) 12 YO from the 1970s, the 1993 Manager's choice, the 12 YO bottled 2011 and the Lagavulin 16 YO. At Lagavulin, there was two legal distilleries at the beginning of the 1820s: Lagavulin distillery founded in 1816 by John Johnston and the other (Kildalton or Ardmore?) a year later by Archibald Campbell. When Archibald Campbell withdrew, Johnston occupied both distilleries. Historical archives from the Customs and Excise indicate that operations at Lagavulin were at a very small scale: the wash still had a capacity of 82 gallons, while the spirit still was only 25 gallons. In 1821, a total of 669 gallons of spirit were produced. When Johnston died in 1836, the total value of the distillery, malt mill, farm and dwelling house was calculated to be £1,692 (£492 for the distillery). A year later, there was only one distillery at Lagavulin. The Grahams acquired it about this time and, according to Barnard, eventually "repaired the place and made considerable additions and improvements. There is not a modern building to be seen. Annual output in 1887 was 75,000 gallons (1, 950 hectolitres). The make was "principally sold in Glasgow, England and the Colonies", and used largely for blending purposes, but also sold as a single Whisky”. Barnard tasted some eight-year old whisky "which was exceptionally fine". James Logan Mackie & Co., the successor of Graham & Co, was then the owner of the distillery. Peter Mackie, a nephew of J. L. Mackie, joined the business in 1878 and paid the first of many visits to Lagavulin in that year. The name of the firm was altered to Mackie & Co. in 1890. The wash still was replaced in 1892 and the old ones became the wash stills at Balvenie. Two of the older buildings at Lagavulin, believed to have been formerly a still house and maltings, were returned to their previous use under the name of Malt Mill Distillery. This happened in 1908, a year after Mackie lost the sales agency for Laphroaig. The aim was to reproduce the Laphroaig whisky. Mackie copied the stills of Laphroaig and recruited the Laphroaig brewer. It appears that the whisky was not comparable. A visitor reported "so thoroughly has Malt Mill been modelled on the ancient lines that there is almost a genuine air of antiquity about the matting floor, the dark haircloth-surfaced kiln and the quaint open fireplace with its brazier of burning peat". Only peat was used for firing the kiln. The two stills and two (three ?) independent washbacks were much smaller than Lagavulin's and the final product was quite different. It had its own maltings but used the Lagavulin mash tun. With a capacity of production of only 114,000 litres in the 1920s, Malt Mill was the smallest distillery of Scotland. After Sir Peter's death in 1924, Mackie & Co. changed its name to White Horse Distillers Ltd. Three years later, it joined The Distillers Company Limited; and in 1930, when the malt whisky distilling activities of the DCL Group were reorganised, Lagavulin was transferred to Scottish Malt Distillers. Women were employed to work the distillery between 1939 and 1941, when it closed for the remaining duration of the Second World War. Malt Mill Distillery was closed down in 1960 and disaffected in 1962 when it became necessary to build a new and larger still house for Lagavulin. Its two pear-shaped stills were added to the two Lagavulin stills (capacity: sprit still: 1450 gallons, wash still, circa 2300 gallons), all four coal-fired by a mechanical stoker system. 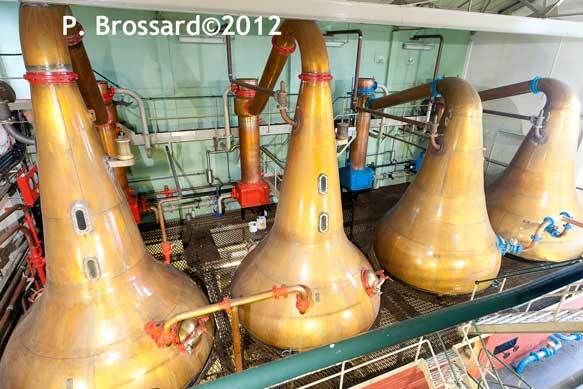 Two stills of the traditional Lagavulin type, and the complete unit of four stills heated by steam from an oil-fired boiler in 1969 replaced the former Malt Mill stills. Malt Mill's buildings were converted into a reception centre for visitors in 1980 (where tasting are organized). The floor maltings operations were stopped at Lagavulin in 1974, with malt provided by the new Port Ellen Maltings. In the 1980s, the production at Lagavulin went down to about 20% of its capacity and in the 1990s, experiments were done with malted barley peated to 45-50 ppm. The experiment stopped at the 1990s, and the resulting whisky was mixed with standard whisky (35 ppm). In 2002, the first 12 YO Cask Strength Lagavulin has been released. www.whisky-news.com/Patrick Brossard © 15 Apr 2012. 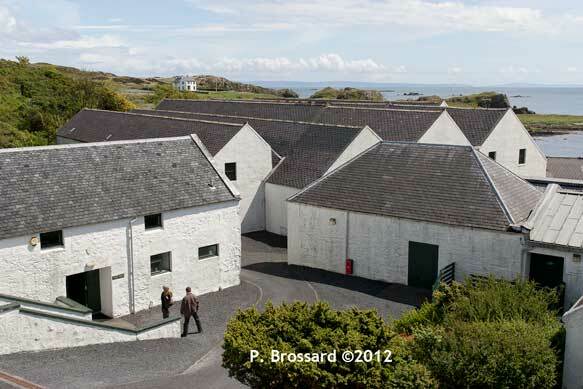 The warehouses at Lagavulin with the old Malt Mill distillery on the left.